The Huawei Mate 10 was announced a little over a month ago and so far, the device is only available in a handful of markets across the globe. The handset has two variants – a single-SIM carrying model number ALP-L09 and a dual-SIM variant with model number ALP-L29. While some markets will be receiving the single-SIM variant, other markets, more so those in Asia, some parts of Europe and Africa, will be getting the dual-SIM variant. 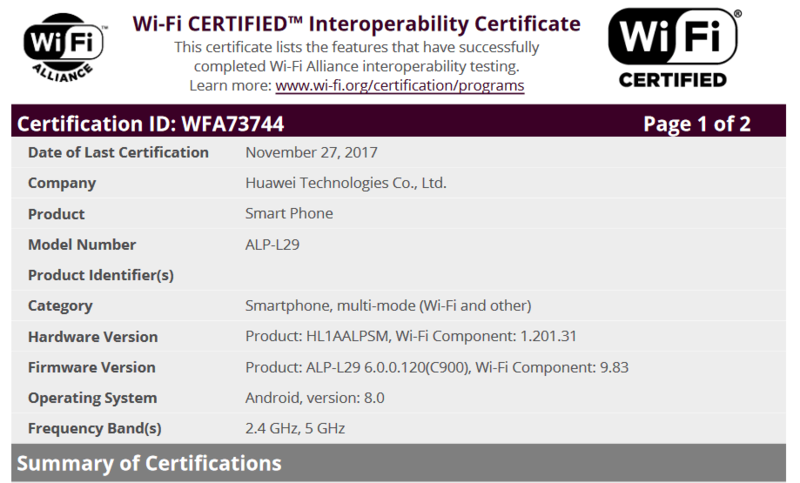 Speaking of the dual-SIM variant, the Wi-Fi Alliance has just cleared this model, which basically confirms the Huawei Mate 10 is heading to more markets across the globe. The dual-SIM variant is popularly referred to as the global variant, but we still don’t know where exactly the phone will be released. Huawei boasts that the Mate 10 is the first handset on the planet with a Kirin AI processor, but that’s not all. The phone, being a flagship that is here to take on the likes of Samsung Galaxy S8, HTC U11 and LG V30, among others, also packs high-end specs and features. Although not similar to the near bezel-less designs we’ve been seeing on recent flagships, the 16:9 display screen on the Mate 10 is still great, especially since Huawei has finally ditched 1080p LCD panel used on the Mate 9 in favor of a better QHD AMOLED panel. The Kirin 970 SoC is paired with 4GB RAM alongside 64GB of expandable storage. Where the just cleared variant uses the SIM 2 slot for microSD card storage, the single-SIM variant has a dedicated microSD card slot. The main camera is a dual setup with a 20MP monochrome lens and a 12MP RGB lens, both with the same wide aperture of f/1.6 and OIS. The selfie camera has an 8MP lens with f/2.0 aperture. For the battery, the Huawei Mate 10 packs a massive 4000mAh battery unit that supports fast charging and software-wise, it’s among the few devices on the market powered by Android 8.0 Oreo out of the box. Like last year, the Mate 10 was accompanied by a high-end Mate 10 Pro and if rumors are to be believed, this model might be heading to the U.S. as an AT&T exclusive. There are some similarities between the two, especially on the inside, but they also have their differences, which are more conspicuous.